Sanders unusually combined playing with that if being a ‘traveller. ‘He travelled around the various Showmen’s Fairs during the summer months. 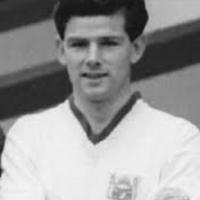 His first club was Bristol City, signing professional for them in November 1951, however, he never made the first team. 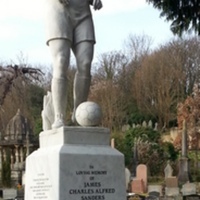 He moved on to sign for Crystal Palace in March 1955, after manager Cyril Spiers (later to manage City) spotted him playing for a Showman’s XI. 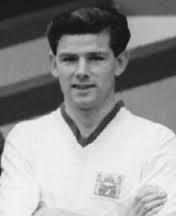 He appeared in 46 league games, until he left the club to link up with Rochdale in 1959 and then Cheltenham Town. 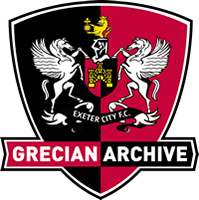 It was from Cheltenham that Exeter City signed the then 29-year-old in August 1962, although he had been on trial with the Grecians the previous year, but they could not afford to sign him. He made his debut in a 3-0 home defeat against Mansfield Town in the same month. 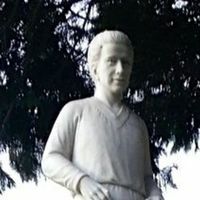 His contract was cancelled by City in April 1963, as the Grecians were unable to give him a club house to relocate his wife and three children in, who were living in Bristol. Saunders said he was struggling to make ends meet living in digs in Exeter and also pay rent on a house that his family were living in. Sanders, who died in May 2007, is buried in Arnos Vale Cemetery on the Bath Road, Bristol. 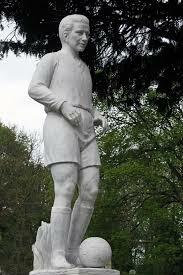 There is a huge memorial (a sculptured footballer, seen below) dedicated to him.